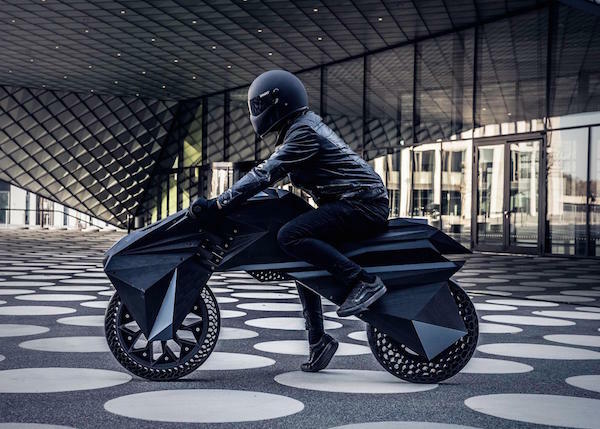 3D-printing company BigRep has unveiled a new era of electric motorcycle called ‘NERA’ that’s fully 3D-printed—save for its electrical components—such as the tires, rims, frame, fork and seat. Although ‘NERA’ is currently unavailable for sale and serves as an example for BigRep to showcase its portfolio plus manufacturing capabilities, who knows where this innovation will lead further down the road? NERA’s makeup was printed in 15 pieces with help from BigRep’s in-house NOWLAB. Its electric engine sits inside the motorcycle’s back rim, while its battery lies snugly within the carrier’s body.